As usual, there's a lot going on in the DCEU, with recent announcements surrounding the Birds of Prey movie and Batgirl, but the announcement of the Deathstroke movie going into development with Gareth Edwards in talks to direct has many DC fans very excited. Joe Manganiello was originally on board to star alongside Ben Affleck in The Batman, but that project has gone through a number of drastic changes over the last year, and Manganiello ended up making his DCEU debut in a Justice League post-credit scene. Now, the actor has revealed his thoughts on what he thinks the standalone Deathstroke movie should be. 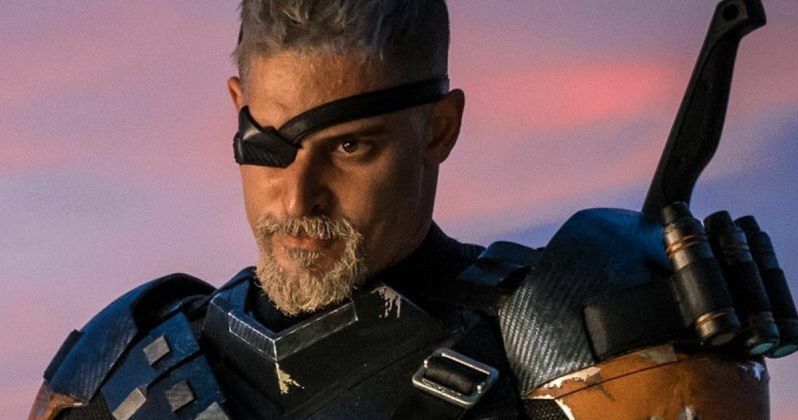 In a new interview, Joe Manganiello spoke about the Slade Wilson character and his research that he conducted to prepare for the role originally. The actor wants to bring some emotional depth to the Deathstroke movie. Additionally, the actor reveals that the story should be more than just the surface aspects of the character. He explains. "I think it's really interesting to tell that kind of a story and tell the truth emotionally of a story like that when you're talking about a man who lost an eye, was betrayed, lost a son. These different types of aspects." Joe Manganiello also revealed that he talked to Ben Affleck about the character when he was still attached to write, direct, and star in The Batman. Manganiello stressed once more that he wants the Slade Wilson character to be multidimensional, implying that the character is more than just a villain. There will be a lot going on in the standalone Deathstroke movie to highlight the reasons why the Slade Wilson character the way he is, if Joe Manganiello gets his way. He had this to say. "When I met with Ben Affleck about Batman, the meeting we were having was for Deathstroke. This is a real opportunity to figure out who this guy is on the inside. Like what he's battling with. The best quote-unquote, I hate calling them this, ya know I don't mind, but I you know calling them a villain is understanding where they're coming from." Deathstroke already has a lot behind it, thanks to Joe Manganiello's work and research into the character. The actor has gone in to study the character and his motivations for the movie and has gone down a virtual rabbit hole to get to the core of the character. Plus, Manganiello is looking into the fighting techniques that Slade Wilson uses and where they originated from. He says. "The Ninjustu school, there are scrolls that are written that have these ancient techniques that are not shared with students that are locked away because somebody is going to go into a bar and rip someone's head off using one of these techniques. What are those techniques? Where are they? Could there theoretically be somebody that would go around and learn these insanely offensive techniques and become this incredible killer?" Finally, Joe Manganiello reveals that he wrote the treatment that ended up getting the Deathstroke movie into development in the first place. However, he is tight-lipped about giving up any more information about what he thinks the movie can be. He explains. I'm rooting it in the world. I'm rooting it in something honest, so it feels real. Then we're talking about the emotional content. Somewhere along that way I know that it was announced where the studio... there was talks with Gareth Evans and talks about an origin movie. I'm not giving news. I spent six months prior to all of those phone calls writing a backstory that was turned into sixteen pages which got turned into a treatment which then led to my Skype call with Gareth." Joe Manganiello is just as excited as the DC fans are about the prospect of a standalone Deathstroke movie. Let's just hope that Warner Bros. and DC Films are able to bring the project past the development stage. You can listen to the rest of the interview with Joe Manganiello and his thoughts about the Deathstroke movie over at Chris Hardwick's IDI0T Podcast.